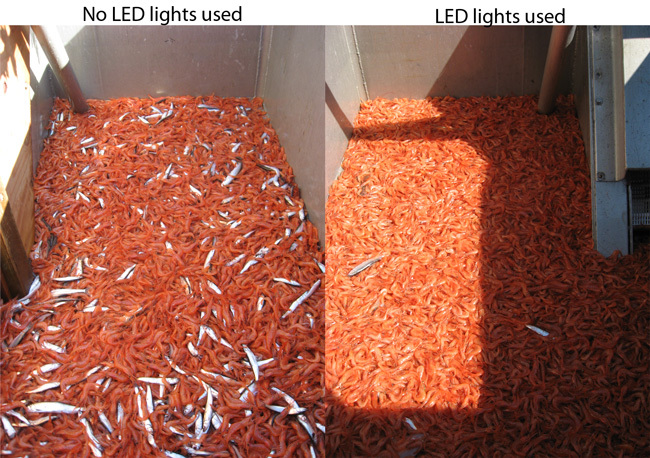 Research conducted in 2014 showed that use of properly placed light emitting diode (LED) fishing lights reduced the bycatch of many species of fish. The use of LEDs along the fishing line of shrimp trawls results in sharp reduction of fish such as smelt, rockfish and flatfish. 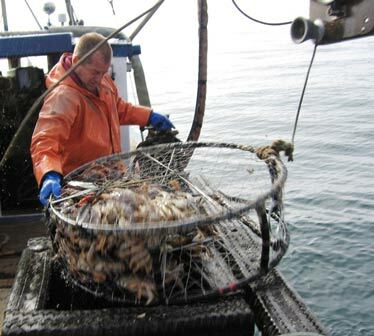 Findings showed 90% reduction of eulachon smelt, 78% reduction of juvenile rockfish, and 69% reduction of flatfish while having no significant impact on shrimp catch. See 2014 mid-season report here. 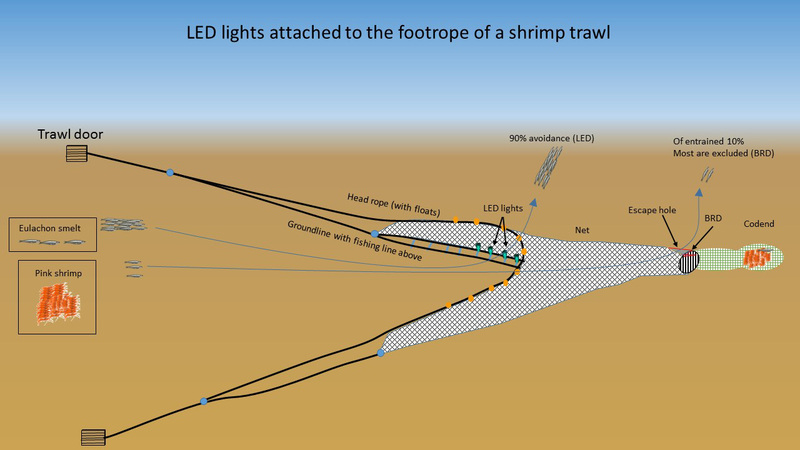 Upon the discovery of their effectiveness in bycatch reduction, the use of LEDs was immediately adopted by nearly all shrimp trawlers in Oregon. The use of LEDs is a leap forward in reduction of bycatch within the shrimp fishery. This was particularly timely as eulachon smelt, a historically common bycatch of pink shrimp trawling, was listed as "Threatened" under the Endangered Species Act (ESA) in 2010. With the strong support of the industry, the use of LEDs became required for Oregon shrimpers beginning in 2018. Since BRDs were used many of the large fish are excluded, however since this was in an area with many small eulachon smelt they were caught. As seen in the diagram, fish see the LED fishing lights then avoid the net. This method is most effective for strong swimming fish such as eulachon smelt, juvenile rockfish and flat fish. Click the illustration for an animation of how this works.